Below is a link to a video that addresses end of life decisions. It's a rap song borrowed from Rhianna and Eminem. Tuesday was day 1 of the latest cycle of maintenance. The routine is the same. Insomnia Tuesday night. Wired Weds at work. A little tired Thursday and super tired by Friday. Yesterday I actually felt pretty good. Went to the gym in the morning. I feel like I'm in good shape and staying ahead of the chemo/cancer fatigue. At work yesterday, I had a site visit with a whole bunch of folks. I had to usher them to an oil area in the heart of the port. Should of been a half hour quick visit. Instead it turned out to be 3 hours out there. 3 hours on my feet. And it wore me out. By the end of the day, I was beat. 3 hours doesn't seem like much, but given I was a couple of days removed from chemo, it made sense that I'd be tired. I forget sometimes what I'm dealing with. That's a good thing. But it was a subtle reminder that I still need to be mindful. It's all good though. 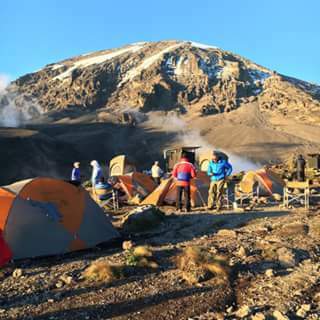 This past week, a team of patients, doctors and advocates climbed Mt Kilimanjaro in support of the MMRF. Very exciting, very cool. Here is a link to a Facebook page with some photos. A story from Today about the challenges of working while undergoing cancer treatment. Thursday January 21, there is a Cure Talk discussion with the MMRF reviewing the advances in Myeloma treatment in 2015. It's at 3 pm west coast/6 pm east coast time. Below is the link to sign up to listen. The below op-ed is from the NY Times and is less about cancer and more about climate change. It's written by Piers Sellers, an astronaut and NASA scientist who was recently diagnosed with stage 4 pancreatic cancer. The article/op-ed is his reason for continuing to work on addressing climate change, despite his dire diagnosis. I’m a climate scientist who has just been told I have Stage 4 pancreatic cancer. I work for NASA, managing a large group of expert scientists doing research on the whole Earth system (I should mention that the views in this article are my own, not NASA’s). This involves studies of climate and weather using space-based observations and powerful computer models. These models describe how the planet works, and what can happen as we pump carbon dioxide into the atmosphere. The work is complex, exacting, highly relevant and fascinating. Last year was the warmest year on record, by far. I think that future generations will look back on 2015 as an important but not decisive year in the struggle to align politics and policy with science. This is an incredibly hard thing to do. On the science side, there has been a steady accumulation of evidence over the last 15 years that climate change is real and that its trajectory could lead us to a very uncomfortable, if not dangerous, place. On the policy side, the just-concluded climate conference in Paris set a goal of holding the increase in the global average temperature to 2 degrees Celsius, or 3.6 degrees Fahrenheit, above preindustrial levels. While many have mocked this accord as being toothless and unenforceable, it is noteworthy that the policy makers settled on a number that is based on the best science available and is within the predictive capability of our computer models. All this as the world’s population is expected to crest at around 9.5 billion by 2050 from the current seven billion. Pope Francis and a think tank of retired military officers have drawn roughly the same conclusion from computer model predictions: The worst impacts will be felt by the world’s poorest, who are already under immense stress and have meager resources to help them adapt to the changes. They will see themselves as innocent victims of the developed world’s excesses. Looking back, the causes of the 1789 French Revolution are not a mystery to historians; looking forward, the pressure cooker for increased radicalism, of all flavors, and conflict could get hotter along with the global temperature. Last year may also be seen in hindsight as the year of the Death of Denial. Globally speaking, most policy makers now trust the scientific evidence and predictions, even as they grapple with ways to respond to the problem. And most Americans — 70 percent, according to a recent Monmouth University poll — believe that the climate is changing. So perhaps now we can move on to the really hard part of this whole business. The initial heavy lifting will have to be done by policy makers. I feel for them. It’s hard to take a tough stand on an important but long-term issue in the face of so many near-term problems, amid worries that reducing emissions will weaken our global economic position and fears that other countries may cheat on their emissions targets. Ultimately, though, it will be up to the engineers and industrialists of the world to save us. They must come up with the new technologies and the means of implementing them. The technical and organizational challenges of solving the problems of clean energy generation, storage and distribution are enormous, and they must be solved within a few decades with minimum disruption to the global economy. This will likely entail a major switch to nuclear, solar and other renewable power, with an electrification of our transport system to the maximum extent possible. These engineers and industrialists are fully up to the job, given the right incentives and investments. You have only to look at what they achieved during World War II: American technology and production catapulted over what would have taken decades to do under ordinary conditions and presented us with a world in 1945 that was completely different from the late 1930s. What should the rest of us do? Two things come to mind. First, we should brace for change. It is inevitable. It will appear in changes to the climate and to the way we generate and use energy. Second, we should be prepared to absorb these with appropriate sang-froid. Some will be difficult to deal with, like rising seas, but many others could be positive. New technologies have a way of bettering our lives in ways we cannot anticipate. There is no convincing, demonstrated reason to believe that our evolving future will be worse than our present, assuming careful management of the challenges and risks. History is replete with examples of us humans getting out of tight spots. The winners tended to be realistic, pragmatic and flexible; the losers were often in denial of the threat. As for me, I’ve no complaints. I’m very grateful for the experiences I’ve had on this planet. As an astronaut I spacewalked 220 miles above the Earth. Floating alongside the International Space Station, I watched hurricanes cartwheel across oceans, the Amazon snake its way to the sea through a brilliant green carpet of forest, and gigantic nighttime thunderstorms flash and flare for hundreds of miles along the Equator. From this God’s-eye-view, I saw how fragile and infinitely precious the Earth is. I’m hopeful for its future. And so, I’m going to work tomorrow. It just might be the right time for President Barack Obama's ambitious "moon shot" to cure cancer, according to experts. Obama announced the initiative Tuesday night in his State of the Union address and put Vice President Joe Biden in charge. "Last year, Vice President Biden said that with a new moonshot, America can cure cancer. Last month, he worked with this Congress to give scientists at the National Institutes of Health the strongest resources they've had in over a decade," Obama said. "Tonight, I'm announcing a new national effort to get it done." It's good time to do it, says the American Cancer Society's Dr. Otis Brawley. For starters, Biden has a proven track record of being able to get Congress to stand with him on this issue: He helped get Congress to add $264 million to the National Cancer Institute's budget in the 2016 spending bill, part of a $2 billion raise for the National Institutes of Health. "He may actually be able to get Republican and Democratic support for this," Brawley said. "The field has obtained such a critical mass of knowledge that now we are ready." But even more important, the research is advancing more quickly than ever, says Dr. Jose Baselga, Physician-in-Chief and Chief Medical Officer at Memorial Sloan Kettering Cancer Center and president of the American Association for Cancer Research. "The field has obtained such a critical mass of knowledge that now we are ready," Baselga told NBC News. "This is the golden era of cancer research," agreed Dr. Ronald DePinho, president of the University of Texas MD Anderson Cancer Center. Money wasn't enough to do it in 1971, when president Richard Nixon declared a war on cancer. Experts didn't even know then that cancer is entirely caused by genetic mutations, and that the place it starts tells a doctor very little about the tumor itself. But money will help a great deal now, Baselga said. "I do think in a great part it's a money issue," he said. "The amount of discoveries that are occurring are many. We see them at a speed that we have never seen before. I think money could go a long, long way." It will take coordination, too, said Brawley. Biden notes this in his comments on the new initiative. "Several cutting-edge areas of research and care — including cancer immunotherapy, genomics, and combination therapies — could be revolutionary," Biden, whose son, Beau, died of brain cancer last year, wrote. "But the science, data, and research results are trapped in silos, preventing faster progress and greater reach to patients. It's not just about developing game-changing treatments — it's about delivering them to those who need them," Biden added. "Right now, only 5 percent of cancer patients in the U.S. end up in a clinical trial. Most aren't given access to their own data. At the same time, community oncologists — who treat more than 75 percent of cancer patients — have more limited access to cutting-edge research and advances." This is precisely what's needed, said Brawley. "We have tremendous difficulty collecting patient data because of privacy laws or the perception that privacy laws are preventing them from doing so," Brawley said. "That is something the vice president can fix in six months." "Nobody is going to cure cancer in a year." Baselga said cancer centers like his own have huge amounts of data that they can share with one another about what genetic changes are involved in cancer. Sharing this information with other centers and with the companies that actually end up making new treatments is critical, he said. "Since every tumor is different, you need to have thousands and thousands of tumors to be able to get a good representation of what is going on." Right now, there is little incentive for anyone to do that. And then there are the disparities. No breakthrough can save lives if people don't get access to it, Brawley noted. "We need to figure out why we have had a 40 percent decline in breast cancer deaths over the last 25 years, but not in nine states," Brawley said. "We have got good data to show that 20 percent or more of women who get a breast cancer diagnosis right now do not get the fruits of the research that has already been done. They get less than optimal treatment." One study found an equally horrifying pattern with ovarian cancer. It found just 41 percent of eligible women are getting chemotherapy delivered directly to the affected area, even though the benefits are so strong that the National Cancer Institute made a rare recommendation for doctors to use it. And it's better treatment, in the form of drugs such as tamoxifen that can not only treat but also prevent breast cancer, that is responsible for half the decrease in breast cancer deaths, Brawley said. Screening in the form of mammograms is probably a distant third factor, after the increased willingness of women to seek treatment in the first place. Bringing down costs will be a huge part of this, also. The average price of new cancer drugs was more than $100,000 a year in 2012. Cancer experts have started to rebel, but they also point out that the promise of profits can attract drug makers into a field where drug development relies on the private sector. Cancer's still the No. 2 killer in the U.S. But the American Cancer Society just reported that 1.7 million people escaped death from cancer since 1991. Former president Jimmy Carter tried out the new cancer drug Keytruda, which helps the immune system take on brain tumors. He says the drug shrank the tumors; doctors note he got pretty good targeted radiation, also. Targeted treatments such as Imbruvica, known generically as ibrutinib, help patients with a hard-to-treat form of leukemia live longer and healthier lives, and free them from unpleasant drug infusions at the same time. Personalized immune therapies involve finding immune cells in patients' own bodies that recognize and attack the tumors, and growing more of them in the lab. They have remarkable results in a few lucky patients. Other advances include studies that show just how diet and obesity affect cancer risk. And, of course, the sharp decrease in the number of people who smoke has helped. Not least, sharing information can save lives. One cancer registry linked a woman's rare childhood ovarian tumor with a genetic mutation that caused her baby boy's seemingly unrelated lung tumor years later, and pointed them to ways to treat it. Another found that more than 8 percent of children with cancer have unsuspected genetic mutations that could run in their families. No single approach is going to wipe out a disease that experts now know is in fact dozens, if not hundreds of different diseases. "Nobody is going to cure cancer in a year," Brawley said. "I don't think anybody going to cure cancer in a decade. We can decrease a lot of pain and suffering due to cancer." Below is article from The Guardian by Ann Neumann about how David Bowie and many others are now controlling their end of life decisions. “A complete surprise,” said Brian Eno. “Shocked,” said Peter Gabriel. After more than 40 years of friendship and, in the case of Eno, regular email exchanges, the news of David Bowie’s death Sunday appeared staggering and unexpected to his friends. The rest of us were surprised and shocked too. Bowie had managed to hide his terminal cancer from almost everyone, even flashing a joyous smile for the release of his new album. Bowie may have been a profoundly unique musician, but his secrecy regarding his terminal condition is increasingly common. Death, particularly for those in Bowie’s generation, is becoming something to control – an event to arrange and manage. The effect can be heartbreaking for friends and fans who had no chance to say goodbye. But it’s also a way for the dying to avoid what they may consider the indignities of disease and the exhaustion of attention. As the Baby Boomer generation continues to age and encounter infirmity and terminal disease, they will continue to demand greater control, refusing to follow doctors into painful treatments and life-extending measures. A good death to this demographic group does not come to the oldest, but to those who have lived well up to the very end. The death of David Bowie was well choreographed, a produced roll-out of images and information. Blackstar, Bowie’s latest and last album, released on his 69th birthday, flew to the top of UK and US charts a few days before his death. Publicity photos, possibly taken then, show him standing, chic as ever, in a dark suit and jaunty hat, a metal roll-up door behind him, his head thrown back in an exuberant laugh. It was the laugh of vitality until, two days later, it was a laugh of defiance. Baby boomers, those like Bowie between the ages of 51 and 70, who were born just after the second World War, have been a restless, relentless generation. Their protests in the 1960s and 70s were no more enthusiastic than their embrace of financial security in the 1980s. Boomers have reformed and reinforced every caprice of their age, so it’s no wonder that now, as they confront aging and the ends of their lives, they’re choosing quality of life over quantity. That means making time for bucket list adventures, foregoing those heroic “do everything” treatments and yes, planning every detail of their deaths. In 2012, Hollywood gasped when the death of Nora Ephron, screenwriter of Silkwood, When Harry Met Sally and Sleepless in Seattle, was unexpectedly announced. Ephron had told no one. But she left clues in her final book, I Remember Nothing, that her days were numbered. Hiding terminal diagnoses is a way for patients to control their deaths. Boomers’ efforts to change the way Americans die are already being felt. Not willing to linger for years in nursing homes, they’re pressing for the legalization of aid in dying, the legal right to receive a lethal dose of medication from their doctor when they have six months or less to live. The movement has garnered a groundswell of support in the past two decades, with four of the five states where it is legal passing their laws (or in the case of Montana, deciding their court cases) in the past six years. More than a dozen other states have grassroots initiatives underway, with six actively considering legislation. Efforts to better plan end-of-life care decisions have garnered attention, too, in recent years, with a proliferation of resources for elders to organize their finances and their end-of-life decisions. Hospice use and home deaths are increasing. A number of bestselling books have recently brought planning options and elder care issues out into the open, including Atul Gawande’s Being Mortal and Katy Butler’s Knocking on Heaven’s Door, in which both chronicled the long and painful deaths of their fathers and addressed medicine’s vagaries. Bowie had every right to protect the privacy of his final days, and if the reports are true that his terminal liver cancer began in his lungs (a common path for lung cancer), this was likely a second round. He long knew then what was coming; the five-year survival rate from liver cancer is about 16%. And it seems he wasted no time in orchestrating his final days. Like everything else Bowie made acceptable for his fans – fluid genders, flamboyant, outrageous clothes, dreams of equality and other worlds – this grand and surprising final exit may signal to the 76 million Baby Boomers now facing their own twilight that there’s no harm in going out your own way. Interesting story and video from David Bowie. He timed the release to be shortly before he died from cancer. I'm a Bowie fan and his early music was groundbreaking. And of course, as a patient with an incurable cancer, I'm interested in how he approached his final days. Give this a read and a watch. A post from my buddy Bill, who is friends with Andy. Powerful stuff. It's my off week from chemo. I'm in the middle of a cycle. Blood counts are good. No Procrit shot this week. I feel good. As I approach 5 years, I think I forget about the severity my disease. Well, maybe forget isn't the right word. Perhaps I ignore it. I did have a couple of reminders this week about what myeloma really is. Also this week, Andy, who is someone I've never met, went into hospice this week. While I have never met Andy I feel like I know him and his wife and their journey and pain via facebook. Andy's wife has consistently posted about Andy's condition...both in good times and sad times. Andy is young, has two young kids and has been fighting mightily. The myeloma just became too powerful. It's really a heartbreaking story. For some reason, early this week I decided to read some of my older posts from 2 or 3 years ago. Interesting but not interesting. My posts aren't much different than they are now. Chemo, working, trying to figure out the meaning of all this. It's frustrating and I get angry at myself. I shouldn't be writing the same things today as I was then. I mean, the good news is I'm alive and doing remarkably well. But it's also maddening in that I should doing more to embrace life, that every day I ought to be celebrating everything. But I'm not sure I am. As we start the new year, I'm going to work extra hard on this. Here's a good story from the Wall Street Journal about recent advances in treatment options for myeloma. It's an easy read.